San Diego Regional EDC is always looking for new and innovative ways to tell San Diego's story. So we thought we would use one of our most prominent industries as a new way to do this - Beer! Ballast Point started in San Diego in 1996 and has been growing here ever since. Today, the company directly employs nearly 400 people in the San Diego region and impacts more than 1,000 jobs. 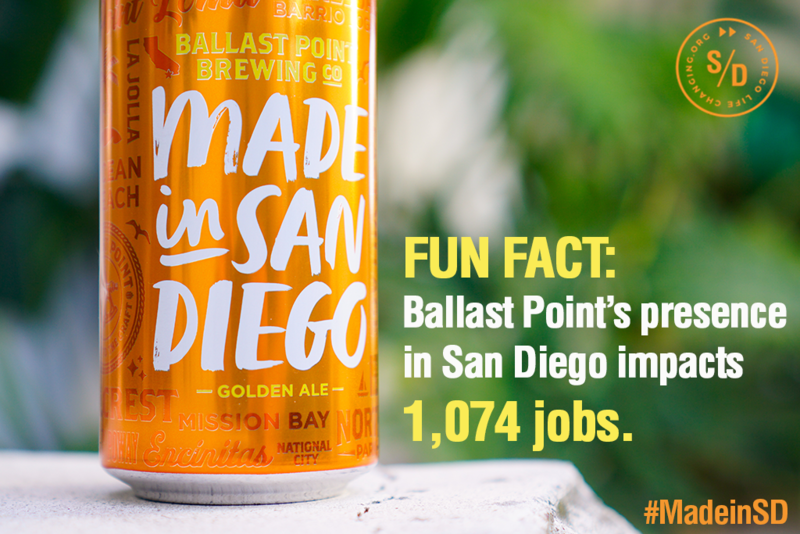 As a way to give back to the region that has given them so much, San Diego Regional EDC has partnered with Ballast Point to launch a special 'Made in San Diego' beer. And because Ballast Point knows the true meaning of community, it will be donating a portion of every case sold to a new fund created at EDC's foundation to support local entrepreneurs that have the same dream of growing a business right here in this life-changing community. Just like this special 'Made in SD' beer, San Diego: Life. Changing. was created by San Diego, for San Diego, to tell the story of a region we’re all proud to call home. The beer is now available at stores, restaurants and bars across San Diego. Cheers to you. If you are looking for information about the Made in San Diego brand mark, and how you can leverage it for your SD-made products and services, click on the icon below.